Versatile Designer, Husband and Father who loves churros, my dog and Jesus (not specifically in that order). 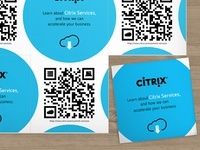 QR Promo Cards, Citrix — Promo "Business Cards" for Citrix with customized QR code. Social Share - DailyUi 10 — DailyUi Challenge #10 - Social Share.